Click on a graph below to enlarge the image. "Implementing CHAMPS into Fort Bend classrooms is a three-year district-wide initiative. Fifty-one of seventy Fort Bend campuses have been trained in the CHAMPS Classroom Management system. Thirty campuses were trained in the 2008-09 school year, twenty-one campuses received CHAMPS training in 2009-10 and the remaining 19 campuses are scheduled for training in the 2010-11 school year. "Fort Bend ISD has experienced much success with the CHAMPS initiative. 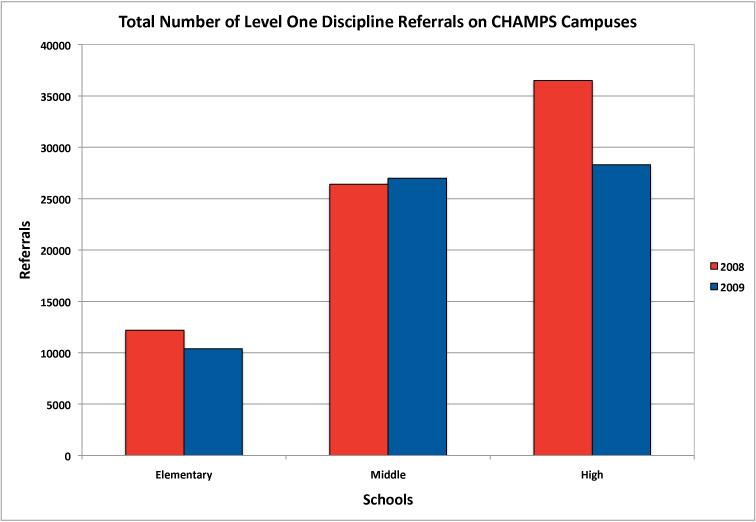 The total number of level one discipline referrals for CHAMPS campuses has decreased. The elementary CHAMPS campuses showed a decrease from 11, 962 to 10, 475 level one discipline referrals. While the middle school CHAMPS campuses did not show a total decrease in level one referrals, three of the eight campuses did show a decrease in numbers and two of the eight campuses have shown a steady decline in level one discipline referrals. Furthermore, all of the high school CHAMPS campuses showed a decrease in level one discipline referrals from 36, 793 to 28,429." 31% of students are classified as Economically Disadvantaged. 43% of students are classified as At Risk. 7% of students receive Special Education Services. 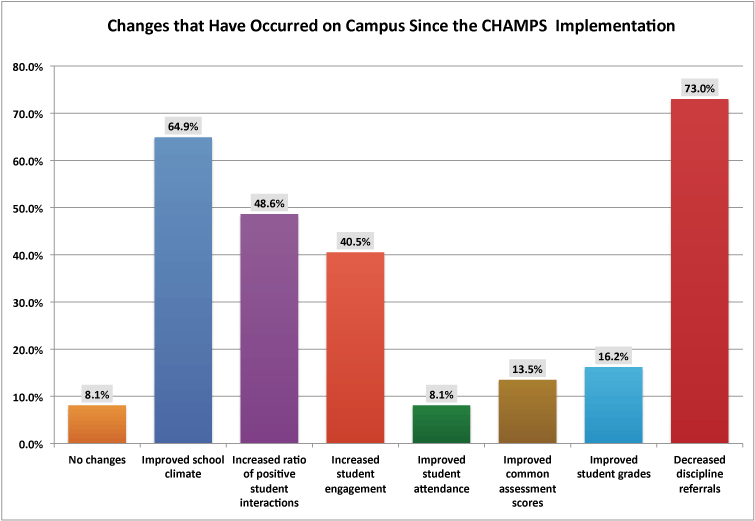 "Implementing CHAMPS gave us a framework to improve discipline campuswide at Oakland. This framework provided teachers in the classroom and staff members throughout the campus with a consistent plan for appropriate student behavior. In the process, we had a 78% decrease in the number of discipline referrals from 2008-09 to 2009-10! We are sold on CHAMPS!" Download a copy of this page. "We are very excited that the discipline referrals have dropped so dramatically in such a short amount of time! As well, it is no coincidence that we have attained exemplary status for the first time in many years! Certainly much of our success can be attributed to our teachers and staff and their fidelity in implementing CHAMPS consistently throughout our building. Lexington Creek has a calm, yet engaging environment, in which all students are able to achieve!"